We’re so excited to share this recent spotlight on BDU’s CEO Lisa Peskin for ASI’s Advantages magazine! 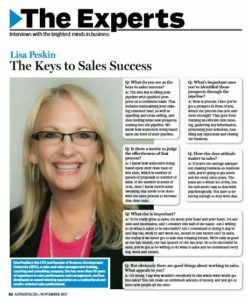 In Lisa’s Q & A, featured in the magazine’s “The Experts” section, she discusses what she’s discovered to be the keys to sales success. Click here to download a PDF of Lisa’s Q & A.
Click here to read the full November issue of Advantages magazine. 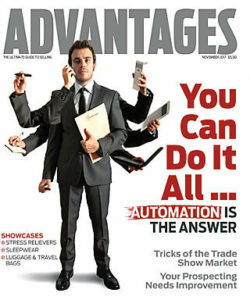 Advantages is the leading industry publication for distributors with content that “regularly gives distributor sales people a leg up on their competitors.” For more information, or to subscribe, please visit www.asicentral.com.